A recording of the orchestral version was made by Robert Cohen and The Philharmonia conducted by the composer, first issued on Sony CD HB3 in 1991 and re-issued by Sony BMG Music Entertainment UK Ltd 8697376972 in 2008 with a new booklet and artwork. Programme-note by the composer: The work pays mischievous homage to instrumental suites of the past. The Scherzo is not quite a scherzo, the March more than a march. The Waltz has a wrong-stepping jazz tinge to it, the Aria a sudden profundity. The Serenade bursts into arrogant display, the guitar-like Sarabande becomes an eloquent cadenza. We are led back to the theme of the Prelude via a Finale of such bristling virtuosic energy that its simple melodic line assumes a far more complex character – having been well and truly ‘diverted’. A new lease of life was given to the work in November 2010 when the brilliant young German cellist, Benedict Kloeckner, accompanied by Spanish pianist Jose Gallardo, won the penultimate round of the EBU Young Artists Competition in Bratislava, which led to Benedict playing the Elgar Concerto and winning the entire contest. To celebrate the event Howard transcribed his violin sonata for cello and piano and in the following Spring assembled an entire recital of cello and piano music for Benedict, which the two of them performed in concert in the Historisches Cafehalle in Schlangenbad near Mainz on May 8th 2011. The recital consisted of Pennillion, Diversions, Jazz Dances, Cello Sonata and various encores, including a new cello and piano version of 'Walking in the Air'. Howard is unable to play having unfortuately sufferred a broken wrist. He will however be present to act as mediator. Recordings of Howard Blake's works for cello and piano commenced at the studios of SWDR in Kaiserslautern with 'Tonmeister' Ralf Kolbinger July 12-14 2013. The composer was interviewed on the 12th by producer Sabine Fallenstein for the radio station and an album scheduled for release on the record label GENUIN. The decision to record followed up Benedict's triumph with Howard's 'Diversions' in the version for cello and piano in 2010 which won him the EBU youth musician prize and thereafter gave rise to succesful performances with various pianists including the composer himself. Howard was invited by Benedict in 2011 to join him in a complete recital of his works in the delightful venue of the Schlangenbad Historisches Konzerthaus outside Mainz. This proved to be an astonishing success, with a capacity audience who demanded endless encores and gave repeated stand-up ovations. The repertoire for this recording largely mirrored that of the concert. Recording was finally completed on January 28th 2014 and included the addition of the work 'The Enchantment of Venus' for cello and piano. The recital included Howard Blake's 'Diversions' for cello and piano and the first performance of 'Prelude for Benedict' for solo cello, in an arrangement created specially for the occasion by the composer who was in attendance. The concert was a resounding success and, echoing the orchestral concerts with the Berlin Chamber Orchestra earlier in the year 'Archangel's Lullaby' was done as one of the encores. The event was recorded by Bavarian Radio. Kloeckner and Gallardo play 'Diversions' again - Howard's virtuosic work for cello and piano that qualified them as finalists in the EBU youth music prize 2010 and led to the winning of the first prize. The programme couples the work with a Brahms sonata. 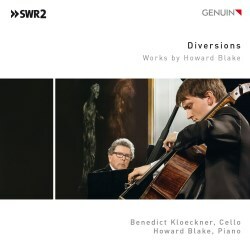 Review of 'Diversions' - an album of music by Howard Blake for cello and piano played by Benedict Kloeckner and the composer, released 2015 by Genuin. Der englische Komponist Howard Blake ist eine lebende Legende: Soundtracks wie „Mit Schirm, Charme und Melone“ oder der mit dem Academy Award nominierten „Schneemann“. Dass einen solch ein Musiker zum Musizieren einlädt, ist wahrscheinlichsehr selten. Dass er dann aber auch noch ein neues Werk zur Ersteinspielung aufs Pult legt, mag an ein Wunder grenzen. Benedict Klöckner aber erweist sich dieser Ehre als absolut würdig: Der Shootingstar der Cello-Szene verschmilzt in der neuen GENUIN-CD mit dem Grandseigneur selbst am Klavier zu einer Einheit: Die ganze Vielfalt des Blake‘schen Oeuvres, seine rhythmischen Finessen und sein Witz leuchten in tausend Farben. Für Kammermusik- und Filmmusik-Fans ein Muss! Auf WDR3 TonArt wird am 13.05. ein Porträt über Benedict Klöckner gesendet. "Der Cellist Benedict Kloeckner spielt Werke von Howard Blake, der Komponist selbst übernimmt den Klavierpart: Das Ergebnis ist rundum schön." 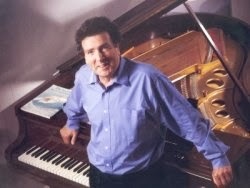 ...Robert Cohen gave a joyous, virtuoso account of Howard Blake's attractive 'Diversions' on his newly-acquired Tecchler, with the composer at the piano. In Howard Blake's 'Diversions' for cello and orchestra, an attractively picaresque suite of eight linked movements, soloist Steven Isserlis seemed completely unfazed, veering effortlessly between sections of exquisite tonal shading and passage-work of considerable complexity. As accompanists, Handley and the Royal Liverpool Orchestra were deftly sensitive. The chorus had a much deserved night off yesterday as The Royal Philharmonic Orchestra produced some marvellous playing under principal conductor Vernon Handley. It was an opportunity to hear some unusual music - three of the four items being real rarities. By far the most interesting was Gordon Jacob's transcription of Elgar's Organ Sonata in G. But Howard Blake's Diversions for Cello and Orchestra- also originally coceived in a more limited form for cello and piano- came a very close second in its orchestral version. The cellist Steven Isserlis gave a vigorous and convincing performance. It is unusual to find a group of distinguished artists, with the Bach Choir and the Philharmonia Orchestra, giving a concert in the Royal Festival Hall devoted to the music of a 50-year old composer, but that is what happened on 2nd June. Howard Blake has...in recent years received many commissions from ballet companies, orchestras, and brass and vocal ensembles. On this ocasion...the composer himself directed the lively 'Diversions' for cello and orchestra. The solo part was played with dazzling virtuosity by Steven Isserlis and the overall effct of this piece which 'pays mischievous homage to instrumental suites of the past' was plaeasing. The dearth of repertoire for the solo cello should encourage more composers to write for the instrument ... 'Diversions' is a welcome newcomer which could become an old friend. The eight movements all have an individual character, made more convincing by economic scoring in which each theme or effect is clearly defined. It is a bright, colourful, tuneful piece with tremendous rhythmic drive, especially where a little Spanish influence seems to creep in.